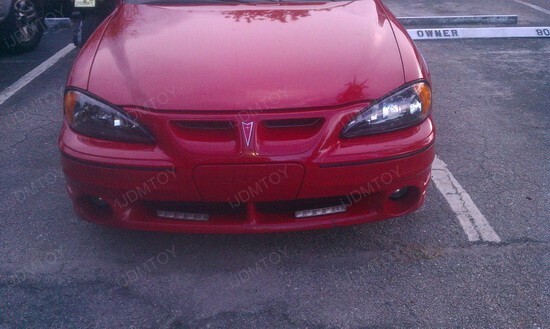 Check out this 2004 Pontiac Grand Am GT and its trendy LEDayline DRL – absolutely stunning combination. 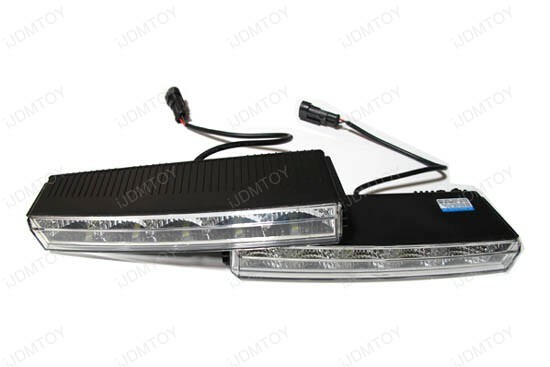 This Ultra-slim lights design is known as Hella LEDayLine, initially designed by the famous German automotive part supplier. This design matches perfectly to the red beauty on the pictures, and as you can see – it makes the whole vehicle look more sporty and classy. The secret of the maximum lighting output of these LEDayline DRL is hidden in the 10 pieces high power SMD LEDs each lamp has. Since LED technology is way more innovative and power efficient than regular halogen bulbs, driving with the LEDdayline DRL on, measurably decreases fuel consumption. And that’s not everything – the highly effective signal light increases the vehicle’s visibility to oncoming traffic during the day, which means it contributes to the safety improvement, too. So, this equipment is perfect for both daytime and night time use. 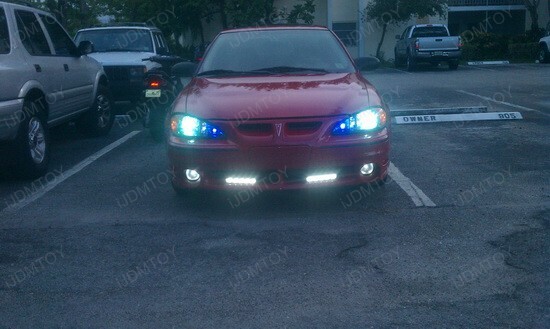 However, the featured LED tuning project is a very good example for proper use and achieving stylish appearance at the same time. 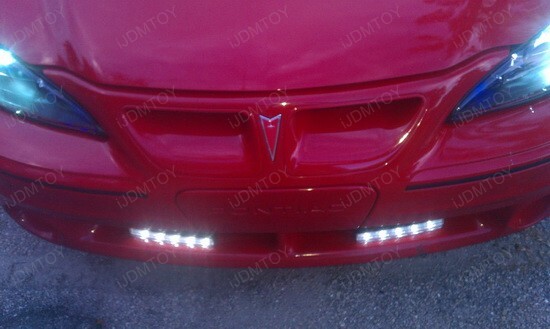 The cool part is that this quality iJDMTOY product is universal fit, so you can install it on any car, SUV or truck. It even comes with the wiring harness for easy installation. 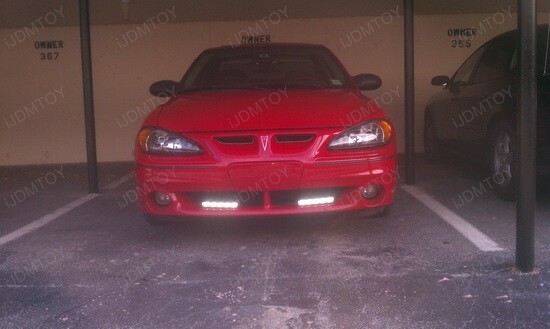 This kit is commonly installed in between the bumper grille, or below bumper to work as DRL lights or Driving Lights and most of our customers describe it with one word "Amazing"! If you wonder how to improve both the safety and the appearance of your vehicle, start with purchasing a pair of LEDayline Daytime Running Lights. This kit really worth the money and the owner of that 2004 Pontiac Grand Am GT knows it. Go get your awesome Euro Look – you just can’t go wrong with iJDMTOY. New and existing iJDMTOY customers can save additional 20% off from already reduced prices on all the car LED bulbs, when you order over 150 dollars. 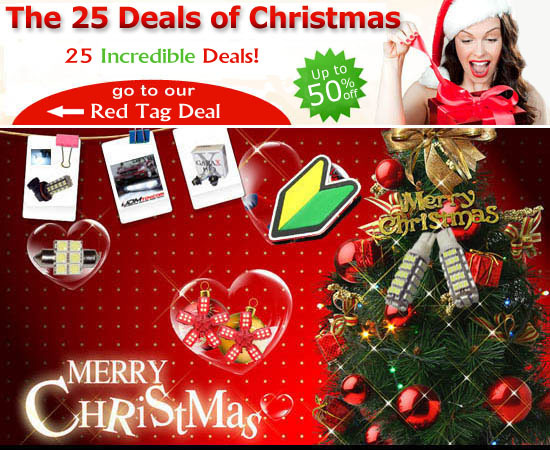 This Mega iJDMTOY’s Christmas Santa sale runs from Dec 15, 2011 to Dec 25, 2011.